Actually 62 games into the season, but the most games by any single Bull is 55 (Justin Christian). Also, these numbers do not include the stats from the June 6 game against the Pawtcket Red Sox. Probably a good thing. The mid-season is upon us, only 10 games away. This table keys to two relatively new stats that we like a lot. The first is Weighted On Base Average (wOBA) and the second is Weighted Runs Above Average (wRAA). Think of them as two measures of overall offensive contribution to the team. 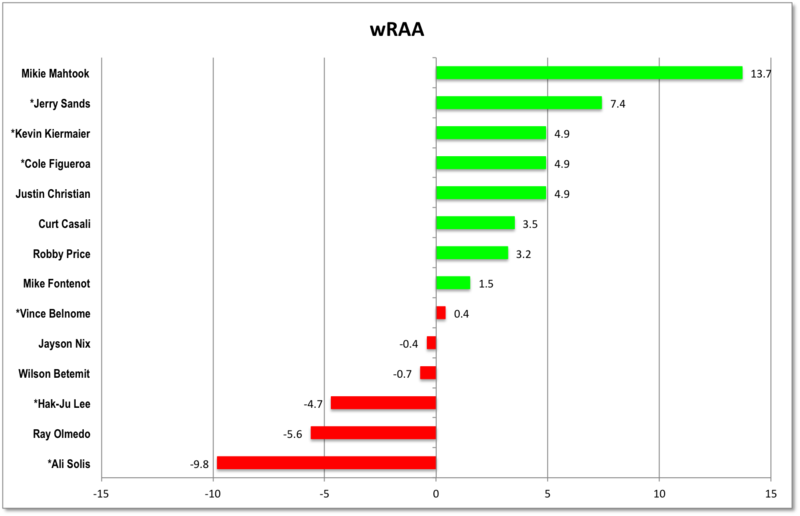 The table is sorted by wOBA, the chart is sorted by wRAA. Players with * are on the Rays 40-man roster. The players who are struck through are currently with the Rays, but we expect at least two of them back (Solis and Sands). Those two Bulls have been added to the Rays' 40-man. Congrats to them both. Comparing this table to the one from mid-May two tables what jumps out is Mikie Mahtook’s improvement from .363 to .406. Vince Belnome’s uptick from .310 to .330 is welcome. Hak-Ju Lee improved from .274 to .285, but he has a long way to go in his hitting. Worrisome are the slight drops in the numbers of Wilson Betemit, Mike Fontenot, and Cole Figueroa (although Figueroa spent several days with the Rays over this period). A pleasant surprise are Robby Price’s numbers. For a guy who keeps getting added to/dropped off the roster, he’s doing very well.